CHICAGO--(BUSINESS WIRE)-- Hyatt Regency Xi’an opens in Xi’an, the capital of Shaanxi province in northwest China, and marks the return of the Hyatt Regency brand to one of China’s oldest cities. The 298-room Hyatt Regency hotel fosters connections and serves as a dynamic, energizing place where guests can collaborate and find inspiration. Hyatt Regency Xi’an is conveniently located in Qujiang District and is home to the Eight Great Sights of Chang’an, a collection of scenic areas near Qujiang Lake. A 45-minute drive to Xi’an Xianyang International Airport, Hyatt Regency Xi’an provides convenient access to both the Xi’an Convention Center and world-renowned tourist sites like Wild Goose Pagoda and the Terracotta Warriors. Inspired by Xi’an’s rich history, the hotel honors the prosperous Tang Dynasty by connecting the old city to the new city through design. Hyatt Regency Xi’an welcomes guests with impressive pitched ceilings, a sprawling layout built around a grand lobby and a front entrance illuminated by a sea of fiery torches, paying respect to days when Xi’an served as the gateway between China and the rest of the world through the Silk Road. Inspiring sculptures and art displays dot the grounds, updating the traditional with modern interpretations of icons like Chinese lanterns, paper cuttings and official seals, while subtler details play on symbols of prosperity. Motifs derived from icons like seed-filled pomegranates weave their way into everything from art installations at the front desk to the inscribed number plates on the door of every room. “Xi’an has long held a special place in the heart of Chinese civilization. As a native of Xi’an, it is my honor to welcome back new and former guests. This hotel allows them to truly experience the very best of our city and its incredible culture,” said General Manager Z. Du. 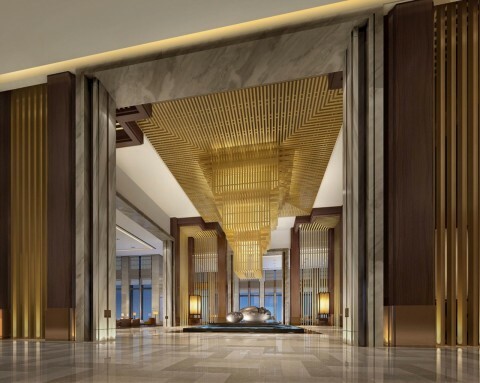 Hyatt Regency Xi’an features 298 guestrooms and suites ranging in size from 538 square feet (50 square meters) to 2,777 square feet (258 square meters). Most guestrooms offer a private balcony, and all are designed along one of three design themes that reflect the prosperity of the Tang Dynasty. Each standard guestroom offers stunning unobstructed views of Qujiang Lake, a 48-inch flat-screen television with cable and satellite channels and an oversized work desk and large walk-in closet, in addition to modern amenities, including wireless high-speed Internet access and mobile phone docking stations. The hotel’s 33 spacious suites offer guests a private balcony, as well as access to the Regency Club lounge, which offers complimentary breakfast and happy hour refreshments, an exclusive lake view terrace, and business and meeting room services. For exclusivity above all else, the Presidential and Chairman’s Suites boasts a sprawling grass terrace, a private outdoor pool and an in-room kitchen, while the latter offers its own Jacuzzi and massage room spread over two floors. The restaurants at Hyatt Regency Xi’an build off Hyatt’s history of culinary excellence, while showcasing the best of the city and its storied history. A unified design theme runs through all the outlets, infusing each space with symbolic elements of the fortune that has graced the city since its inception. The Lounge begins guests’ culinary journey with three separate spaces decorated to reflect different regions of the Silk Road. Light snacks and signature offerings are served throughout the day, and its tranquil lakeside setting makes it the perfect spot to enjoy a coffee or a glass of champagne in the evening. Market Café bustles with activity as the hotel’s all-day dining restaurant, serving delicacies from East and West with lively show kitchens. À la carte items are prepared to guests’ requests and the restaurant’s variety makes this restaurant a popular choice for all occasions. Hu Pan offers authentic fare from around China with a focus on northern signatures and local Xi’an specialties, from Xi’an-style wraps stuffed with abalone to Beijing duck fired with date wood. The restaurant features high, exposed arched roofs and 10 private dining rooms. Hyatt Regency Xi’an features more than 43,000 square feet (4,000 square meters) of pillar-less, naturally lit event space serviced by professional event, catering and Meetings, Incentives, Conferences, and Events (MICE) teams. The flexible spaces include a 13,100-square foot (1,220-square meter) Regency Ballroom ideal for large meetings and events, a 4,600-square foot (405-square meter) Regency Salon and a standalone Pavilion featuring nine versatile rooms set around a central sky lit atrium. Weddings are available in all the event spaces of the hotel, highlighted by an elegant outdoor lakeside chapel. Guests are invited to recharge in the hotel’s FLO Spa and fitness facilities. An oversized Zen rock garden welcomes guests into a temple of relaxation designed after the Chinese theme of “shan shui,” a totem of the timeless beauty of the natural world. Featuring eight luxurious suites and a relaxation area, guests can enjoy treatments that are inspired by traditional principles and natural ingredients. The 1,890-square foot (176-square meter) glass-walled fitness center is fully stocked with Life Fitness equipment and a separate yoga room. A large adjacent heated indoor pool comes complete with cushioned day beds and a dedicated bar.